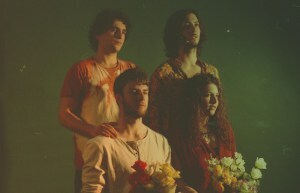 Cristobal & The Sea have are modern hippies to the core. With a beautiful spirit in their music, you can hear the bohemian vibes and recorded spontaneity in every note. Cristobal & The Sea bring a touch of the exotic to their psychedelic sounds, consisting of Alejandro Romero from Spain (bass/ vox), João Seixas from Portugal (guitar/ vox), Leïla Séguin from Corsica/ France (flute/ vox) and Josh Oldershaw from the UK (drums). Their sound is beautifully unique with peaks and troughs in energy and emotion; if you added electronic influences, bossa nova guitar and rippling beats to Manu Chao's vocals, you might get close to this dreamy dance. Their use of lo-fi recording techniques and minimal numbers of takes while working with producer Rusty Santos (Animal Collective, Vashti Bunyan, Grizzy Bear) has lead to a really interesting combination of sounds. We think Peach Bells is going to be a fascinating EP. Out 08.12.14 on City Slang.